This commentary on Mother Holle, or Cliona and the Three Caskets was written some thirty years ago and has circulated privately among Aristasians since then. We are happy to introduce it to a wider public. All modern literature attempts to depict some material occurrence,whether physical, emotional or psychological. It prides itself on its "realism". All traditional literature seeks to depict transcendent Realities in one form or another. Behind the deceptively simple appearance of traditional myths and folk tales lies a wealth of spiritual science. The modern patriarchal world has banished these "fairy tales" to the nursery, not because they are too simple, but on the contrary, because they are so far above the level of modern materialism that it cannot begin to understand them. In order to illustrate this point, we offer the following commentary upon The Three Caskets, a story that has survived in many parts of the world and found its way, in different versions, into numerous folk tale collections. It is to be hoped that having studied this, the reader will look with new eyes upon all traditional stories. This tale, in fact, depicts the Lesser Mysteries; the first stage of the soul’s initiatic journey to Perfection, It is through this first journey that she sheds her worldly nature, recovers the scattered treasures of her soul and returns to her primordial state of True Maid from which she has fallen, regaining her "central" position on the World Axis from whence she may return to our Mother God. 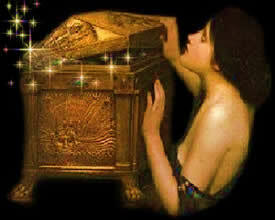 Once upon a time: the first words of the story refer to its setting not in earthly history, but in the Primordial Time. The wicked stepmother appears constantly throughout folk-literature, often with her equally evil daughters. Who is she? She is Maia-Werde in her dark aspect: the creator and sustainer of the illusion of the material world. In matriarchal tradition a household is a microcosm (little world), therefore the household of the wicked stepmother is the world of matter itself. The heroine does not belong to this world; she is in it, but not of it. She does not forget that she is really the child of her true Mother, who is "in Heaven" both on the literal and symbolic levels of the story. This "true birth" of the heroine is akin to the royal birth of the protagonists of other stories, which is often not discovered until the end; for True Maid is the Princess Regent of the Celestial Queen on earth. The stepsister, on the other hand, is an infidel: a true daughter of the material world. We may note that the materialism of the modern world, which believes that maid is a by-product of physical matter is the mentality of the ugly sister organised into a doctrine: while the modern progressism which attempts to derive art from "primitive" scratchings, religion from "fertility cults", language from animal grunts, etc. and ignores the Divine origins (the true Mother) of humanity, produces a bleak and hideous civilisation cut off from all beauty and meaning. It is according to this same metaphysical law that the stepsisters are invariably ugly [cf. The Philosophy of Beauty]. Spinning is the characteristic activity of Maia, and here represents a purely worldly occupation, though later we shall see something of its higher significance. Fate (Werde or Fortuna in the person – literally persona, mask – of the stepmother) is against Cliona, and she cannot possibly win the contest. Yet paradoxically it is here that Werde begins to show her positive side. There is an eternal ambiguity in Werde, and it has been said "when she is best she is worst and when she is worst she is best". It is good werde which has set luck against Cliona, for through her "bad luck" she shall escape the house of the stepmother and start upon the Quest. Even so,apparent misfortunes in life may actually be good werde; wresting us away from attachment to the world and setting us upon the Path. We have seen Werde as Maia, the spinner (creator of the world-illusion) and Werde the weaver (its sustainer). Now we see her as Kala who cuts the thread and destroys illusion, at once the "worst" and the "best" of the three. She rushes forward to "kill" Cliona and cuts her off from the household of matter. Down the well she falls. This is the descent into the psychic world where the soul must recover the scattered fragments of her psychic substance, becoming again her whole self. The Wicked Stepmother has as her antithesis the "Fairy Godmother". The term God-Mother is, naturally related to our Mother God, and represents in various ways, the Divine care of the pure soul. 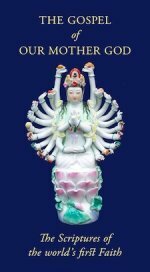 In this story, that role is played by Mother Holle – the name is a very ancient designation of the supreme Mother God particularly in the "sky-goddess" form of Ouranya, the Celestial Thamë. Sai Thamë is said to be the mother of Sai Werde; and Mother Holle in this story is the Spirit in the guise of Werde. She plays the role of the Ranya (who manifests our Mother God herself to her pupil) in setting the initiatic tasks and yet she appears not to be the Instructress. That role is played by her servants: the cats who belong to her farm and the sparrows who are denizens of her sky-domain. She herself feigns ignorance of her pupil's instruction, while all the time watching over her. She, like Werde, "directs" the fate of both girls, while at the same time their fate is shaped by their own actions. Your face is like the moon and mouth very huge. Having passed the tests of compassion and become bonded to her Ranya in the person of Mother Holle, Cliona is then confronted with three impossible tasks. There is no means by which fallen maid can, of her own power, achieve the Primordial State. It is only through divine Grace that the task con be accomplished. The birds and cat represent the messengers of that Grace. Birds are frequently a glyph for "angels" in traditional lore. In the first two tasks they give her the instruction needed, even as Our Mother God, speaking through the Ranya (spiritual mistress), instructs the initiate. In the final task She does the work Herself through Her messengers (angel = Gk. messenger), for while the preparation for realisation is human (though dependent upon Divine support via the Tradition), the final completion of the task is wholly an act of Divine Grace. Space prohibits a full exegesis of the meaning of the tasks, but let us at least note two things: firstly that the final task again reflects Maia-Werde, but this time in her higher or light-aspect. This recognition of her higher nature is due to a transformation of consciousness represented in the earlier counterchanging of the black and white threads, in which the initiate both experiences and transcends the paradoxical ambiguity of Werde. Secondly, this final task, involving the working of an unworkable material, mirrors the task set by the stepmother at the beginning. There is an inverse relation between them – the quest for satisfaction on the material level which seems merely difficult, but is in fact impossible; and the transcendent quest which seems (and in one sense is) impossible, but by Divine Grace may be accomplished. The choice of the three caskets is a familiar theme, perhaps most famous from Shakespeare's Merchant of Venice. On the simplest level, it has to do with humility and the rejection of worldly wealth, but there is a deeper symbolism which at first may seem a little puzzling. Normally gold would symbolise the solar and spiritual domain, silver the lunar and psychic, and lead the earthly and material. This underlies the inner meaning 0f the alchemical transmutation of lead into gold. But here it is lead which is the spiritual choice. Again, we must bear in mind the inversions which operate in the "mirror-world" of the psychic domain where "to be raised up is to be cast down and to be cast down is to be raised up". Thus the terms are reversed, with gold symbolising worldliness and lead the virtues of poverty and humility. Again, gold symbolises the outward, fiery guna of rajas in its desire-attachment to the world, and it is thus that the stepsister is consumed by the flames of her own worldly passion. 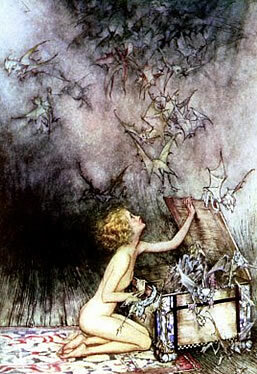 In other versions it is not fire but a plague of toads, spiders or other vermin which emerge from the casket to infest the house, but these should strictly be the contents of the silver casket and not the gold: for they represent the loathsome denizens of the inferior psychic regions which lurk in the "unconscious". This infestation is the reward of those who enter the Quest neither for material gain, nor yet for the one authentic spiritual end, but driven by morbid curiosity, self-obsession, or the considerations of a profane "psychology". It is also the reward of those who, having begun the Quest in earnest are turned aside by a fascination for psychic powers attained on the way. In relation to this possibility, the cats represent the Ranya guiding the initiate past this temptation. Inferior psychism is represented by the dark moon as opposed to the radiant full moon which is Primordial Maid. And the dark moon is precisely the moon of the psyche unillumined by the rays of the spiritual Sun, Who is our true Mother. In this particular symbolism (for of course there are other aspects to the Dark Moon) it relates to the black tarnish that forms so readily on silver. On the level of current intellectual (or rather cerebral) history – for these universal principles can be applied to all phenomena – the silver casket represents the descent into the chaotic relativism of post-modernism as opposed to the stolid hyper-rationalism of the preceding materialistic modernism. In more general historical terms the silver casket corresponds to the descent into inferior psychism that is the inevitable next phase after the descent of a society into simple materialism; and the "infestation" that necessarily accompanies it. By contrast, to the first two caskets, the third casket contains a profusion of jewels and treasures. These are the gathered psychic fragments of True Maid, and the royal raiment of the Princess Regent. Guided by the messengers of Light, she has wielded the sword of discrimination, rejecting the outwardly-attractive inferior elements, and unerringly choosing the True: thus fulfilling the thamë of maid as "she-who-chooses". With this treasure she may return to the world of matter, where she may live in contentment, retiring to a humble dwelling to lead others upon the path that she has taken and to prepare herself for the glorious Quest of the Greater Mysteries. These are but the bare bones of the story's meaning. Each time it is re-read (or, better, retold) contemplatively, it will reveal something new. The Three Werdes: A full examination of the doctrine of Werde and her three Persons.